Cake & Whiskey’s Megan and Mike Smith Prove that Entrepreneurship, Passion, Partnerships and a Very Catchy Name Makes for a Unique Business Magazine for Women. The Mr. Magazine™ Interview with Megan and Mike Smith from Cake & Whiskey. A piece of cake and a shot of whiskey – sounds arrestingly appealing, doesn’t it? Megan and Mike Smith are the proud new parents of a business magazine for women who would agree with that description. Cake & Whiskey magazine was born from gatherings that Megan Smith had among local businesswomen in her city. In her words: “We’d eat cake, drink whiskey and talk shop.” It was a way for women to connect and hash out ideas and concepts, while enjoying some sweet cake and a shot of spirits. Just what the mission of these gatherings was meant to achieve: to motivate and inspire women to send a shot of courage to their spirits and realize the sweetness of success. Since its inception, Cake & Whiskey gatherings are popping up all over and Mike and Megan are partnering with a lot of women’s organizations to make their business magazine available to that targeted audience who will benefit the most: women. Megan said her business plan includes building communities among these women who need and want to connect. The idea is compelling and has success written all over it. Just as the magazine titled Cake & Whiskey does. So slice into some cake and pour yourself three fingers of whiskey, then prepare to enjoy an interview with two entrepreneurs who hope to pass on their message of strength, sweetness and spirit through their magazine that champions those same ideals for all businesswomen. And now Mr. Magazine’s™ interview with Cake & Whiskey’s Mike and Megan Smith. On the creation of the name – Cake & Whiskey: Cake & Whiskey started as just gatherings for women. We’d eat cake, drink whiskey and talk shop. The strength, sweetness and spirit of the words really appealed to me. On how they took the passion of the gatherings and turned it into a business: That’s a great question. 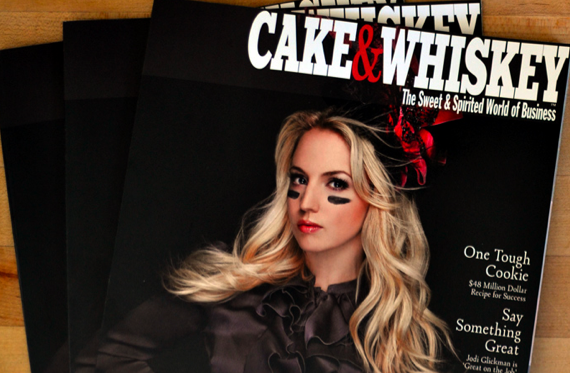 Cake & Whiskey, although it’s a magazine, is kind of a brand. We have Cake & Whiskey gatherings now in other cities. We’re getting ready to launch globally. Cape Town, South Africa is getting ready to have its first gathering. On whether living in the Bible belt produced any backlash about the magazine’s name: I actually expected a backlash, especially from corporations who might say, “Oh, we don’t want to promote alcoholism or anything.” And we’re also reaching out and teaming with a lot of grad schools, and MBA programs, so I was a little wary whether they would be concerned about that. On the magazine’s future – where they’d like to be a year from now: We haven’t taken on any investors yet, and I feel like we’re finally at that point where I can see that next really big level group to play with the big boys and we want to be there. On whether a business magazine for women – a print product – also needs a digital component in this day and age to reach the audience: That’s a great question. Talking about the actual print product; we women still love magazines. I’ll still go to the store and buy a $15 European magazine just because it looks beautiful and I can’t even read what it says. But I get inspired by it. But yes, we’ll have a digital platform, but we’re exploring some really interesting ways of connecting with women globally that’s totally outside the box. And now for the lightly edited transcript of the Mr. Magazine™ Interview with the Publisher of Cake & Whiskey magazine – Mike Smith – and Editor-in-Chief – his wife – Megan Smith. Samir Husni: Cake & Whiskey – it’s a very unusual name for a business magazine. How did you come up with it for the magazine? Megan Smith: I wanted to do a networking group for women in the city where we lived. I was trying to figure out what we would eat and drink and everybody came across cake and whiskey that way. The strength, sweetness and spirit of the words really appealed to me. Cake & Whiskey started as just gatherings for women. We’d eat cake, drink whiskey and talk shop. I really don’t like to use the phrase “networking group.” It’s more of a way to connect women together who are on the business journey, whether they’re entrepreneur or corporate. As I was putting together content for each of the gatherings, I would go to the bookstore and I’d look through Forbes and Fortune, and I love reading about business, but I’m never inspired by business magazines. If they’re not visually appealing to me, I’d rather pick up O magazine or a catalog; I’d rather be looking at something visually stunning. I came home and told Mike there’s just nothing out there that I want to read that has to do with business. And he asked, “Why don’t you just start your own thing?” And that’s how the magazine came about, by just taking that risk and going for it. Samir Husni: Mike, after that first issue came out, have you regretted that advice you gave Megan? We’ve done quite a few small ventures, but this is by far the biggest, most tedious and time-consuming one to date. But it’s good. I think Megan is very creative and inspirational. She is constantly getting feedback from women about how inspiring she is and her writing style is very inspirational and uplifting and not statistical. It’s finding someone’s story and telling what’s best about them. I think, for me, it was a no-brainer from the business and magazine side. I thought it would be a cool magazine. And then the business side of me said, “There are so many women out there in the working world who wants to be inspired and who wants to have something that leans more toward the inspirational.” Most of the stuff out there now is white-haired, old men with statistical information. What’s the newest thing and how do I fix it – just more of an inner-focused kind of thing. Samir Husni: How did you take this passion you had for connecting with other women and turn it into a business? Megan Smith: That’s a great question. Cake & Whiskey, although it’s a magazine, is kind of a brand. We have Cake & Whiskey gatherings now in other cities. We’re getting ready to launch globally. Cape Town, South Africa is getting ready to have its first gathering. I believe the magazine is an element of…and I don’t quite see us as a movement, it’s more of a support system for women and a way of celebrating and championing women in business, whether they’re trying to be President of their local bank branch or they’re trying to start a company. When you walk into a Cake & Whiskey gathering, it’s women of all ages. And so the business plan, for me, when I think of how we grow as a magazine, is about building communities and supporting women in business. On our Facebook page, right now, someone can win a free ad space in the summer issue if you’re a woman-owned business. So the women in businesses are excited about the potential of getting a free ad in a great publication, and they’re getting nominated and they’re telling all their customers to go and vote for them here. So, I think we’re tapping into this missing element. Previously women were, I don’t want to say catty – but in my Mom’s generation, she worked in the mortgage industry, it wasn’t women supporting each other. It was all of them trying to vie for the top spot, with no place at the table for anyone else. Now, I feel like the tables have turned a bit and women are, “How can I help you succeed? How can I help you make connections? How can I celebrate you in your business?” And I would say on the more creative side of the business plan, it’s about building communities. Mike Smith: Part of our plan from the beginning, which is yet to be determined, until we see if we’re successful or not, is instead of trying to raise a ton of capital doing the normal route of loading up bookshelves everywhere, we decided to partner with women’s organizations. So far that has been a very strategic route in getting our distribution going. But still our first issue was 5,000, so it’s not astronomical. MBA Women International is one example. A lot of these we’re working with at the conferences so that we can have a direct distribution route into the hands of the specific target audience that we want to reach – women who are involved with or running businesses. By partnering with them those 5,000 copies, and we have some subscriptions too, will go right into the hands or the demographic of whom we want. We hope that plays two ways in that it gives us a much more viable audience as far as being able to say we know who is reading our magazine, it’s not a guess. There are 5,000 copies and we know who’s reading them. And two, through these organizations, and we are already getting feedback from this, these women are reaching back to us with advertising opportunities and opportunities to get subscriptions for their organizations or the women in their businesses. Megan Smith: I sat down with UPS last week and they want me to speak to some of their top women clients at a luncheon and they’re interested in purchasing some subscriptions for their clients. So a lot of companies and corporations are starting to contact us, those who want to invest in their professional women and this is an option for them to do that. Samir Husni: I have to ask this question, you’re based in Kentucky, and we’re all part of the Bible belt; did you have any backlash because of the name Cake & Whiskey? Megan Smith: I actually expected backlash, especially from corporations who might say, “Oh, we don’t want to promote alcoholism or anything.” And we’re also reaching out and teaming with a lot of grad schools, and MBA programs, so I was a little wary whether they would be concerned about that. But we have not heard one negative, only positive comments about the name. I did some meetings in New York with Citibank and Cartier, and every time I would walk into a meeting, the first thing they would say is we love the name. I feel like we’re in a new day and age. One of the top-selling books right now is called “Sh*tty Mom.” I think you can put a lot more things out there now than you used to be able to. Mike Smith: And Kentucky is the bourbon capital of the world. Samir Husni: What’s the future plans? If I’m sitting with you in a year and I ask…Megan and Mike, where are you now? Megan Smith: A year from now, next fall, we would like to have our first Cake & Whiskey national conference. In terms of the magazine, we’d obviously like to see growth. We’re a quarterly publication and I think we will keep striving for more famous people. I believe everyone has a story to tell, famous or not, but I know that we will be able to access a lot more women to have between our pages and we’ll grow that way. We haven’t taken on any investors yet, and I feel like we’re finally at that point where I can see that next really big level group to play with the big boys and we want to be there. We want to be able to be considered alongside, and I don’t mean we’re in competition with Forbes or Fortune, because we’re not, we’re not even going for the same type of people, but I would like to be on the same playing field as Inc. or something like that. But when someone is talking about a business publication, I’d like for us to come up. Samir Husni: So if somebody stopped you on the street and said, “Give me the elevator pitch about Cake & Whiskey? Megan Smith: What we typically say is Cake & Whiskey celebrates women in business through storytelling. And what I really try and emphasize is it’s for both corporate and entrepreneurial women. I don’t have a firm pitch, but I would say that we like to share our stories in a story format, but in a very beautiful way. We do focus on photography a lot, we try to get top-notch photographers, top-notch writers and just put out a great product. Samir Husni: What keeps you up at night? Megan Smith: I think we would answer that differently. Mike Smith: Our three-year-old, almost every night – somewhere between 2-4 a.m. No, for me, Megan is more of the creative side, she has the whole stress of are the writers going to turn in their stuff and coordinate with the right photographers, that kind of thing. We’re a brand new publication, so I’m thinking more about how do we get advertisers onboard and I’m convinced that it’ll work to spend money to put an ad in that’s going into the hands of 5,000 women business-owners or those people who are going to spend personal and professional money. Being able to get the connections and make that conversation and convince advertisers; I’m continually thinking of that and hoping that continues to grow and also I think about the distribution side. So mine is more the systems and mechanics, I think. Megan Smith: For me, I know that we’ve hit on something really special by the fact that we are on so many people’s radar. One of the executive producers of “The Today Show” tweeted about us. We are out there and we’re going to be out there even more. And I think that what keeps me up at night is that I’m going to drop the ball. And I don’t want to drop the ball. I want to make the magazine a success and not because I necessarily care that we are successful personally, but I am so honored that we get to feature Helen’s Barbeque and we get to feature Helen and tell her story, alongside a venture capitalist from Canada. It’s such an honor for me to be able to do that and I don’t want to mess up the opportunity we’ve been given. Samir Husni: You started as a gathering, a human connection, then came the magazine; what about digital? Do you need a print publication in this day and age to have that type of connectivity with all these businesswomen and their stories? Megan Smith: That’s a great question. Talking about the actual print product; we women still love magazines. I’ll still go to the store and buy a $15 European magazine just because it looks beautiful and I can’t even read what it says. But I get inspired by it. And I don’t think that will ever go away, I really don’t. I’m a pure print advocate. But I think about things like leanin.org and their virtual communities where women can connect by a computer. But there are some things that can be said about gathering face-to-face. One of the groups launched in Pittsburgh and they have a 140 people on their Facebook membership page and it literally just started. There is something within women especially I think to make that personal connection, even when you’re talking about print, just to have that physical touch. Mike downloaded Martha Stewart Living for me on my son’s Kindle and I just can’t get into it on digital. I want to be able to fold over the little pages, bookmark and rip things out. To me, Cake & Whiskey is a tangible way of women connecting. But yes, we’ll have a digital platform, but we’re exploring some really interesting ways of connecting with women globally that’s totally outside the box, that has 100% to do with the computer. But I would say it is still all about that human connection. Samir Husni: We live in a digital age and 5,000 copies are becoming more of the norm, but the business model is changing. Do you really think that you can make it from advertising or do you have to find other means to survive? Mike Smith: Yes. I think that’s part of why we did our distribution the way we did versus going with putting out 20,000 copies on bookshelves and then obviously having to pay up front for those. And at the end of the day, you may or may not break even. So it’s much more heavy-duty. Part of our business model is that we can, hopefully, continue to grow incrementally. If it gets to a point where we need to get on bookshelves, we can hopefully have enough profitability in through subscriptions and our partnerships with organizations, we can do it. That way we’re not solely depending on advertising. Obviously, I think it’s going to be necessary if we continue to expand and grow and we have a pretty small team now. We want to actually start paying those people enough to live off of. And I think advertising is going to be the best way to do that. Megan Smith: From what I’ve studied, with every new magazine, there’s always a struggle. I don’t want to just rely on the magazine to have Cake & Whiskey grow, that’s why it’s great that we have our gatherings that we have and we’re looking toward the national conference and looking at some really unique ways, that possibly other business magazines aren’t really going for, to grow. We’re surrounding ourselves with people who are out-of-the-box thinkers. We’re small enough at this point that we can throw our things against the wall and see what sticks. And that’s what we’re doing. Just putting it all out there and seeing what happens. For me, I would love to get some core advertisers that are partners. That’s really what we’ve been focused on from the beginning, instead of having 50 random advertisers, we would love to have two or three core companies that believe in our mission and want to help it succeed. Samir Husni: How can you translate this sincere passion that you have for Cake & Whiskey, and the magazine’s message, to reality? Megan Smith: Going back to that human connection; when I go and speak to a group of women…I spoke to the MBA Women’s International out in Phoenix and I was on the CEO panel with people from Goldman Sachs, one of the founders of Xbox, and here I am just having launched Cake & Whiskey, and I felt so out of my element. Yet afterward, women were just really connecting with my message. Even now and that was last fall, I get emails weekly from women who say they connected so much with what I had to say and they love the magazine and loved connecting with all those women. So I hope that the passion translates from me, to the other women who love the magazine. And now we’re getting these random ambassadors from all over the country singing our praises. We’re not asking them to, they just love the magazine. And that’s all we can hope for, that it’s touching people’s lives and they’re excited about it. And that it propels women to take risks and try new things.